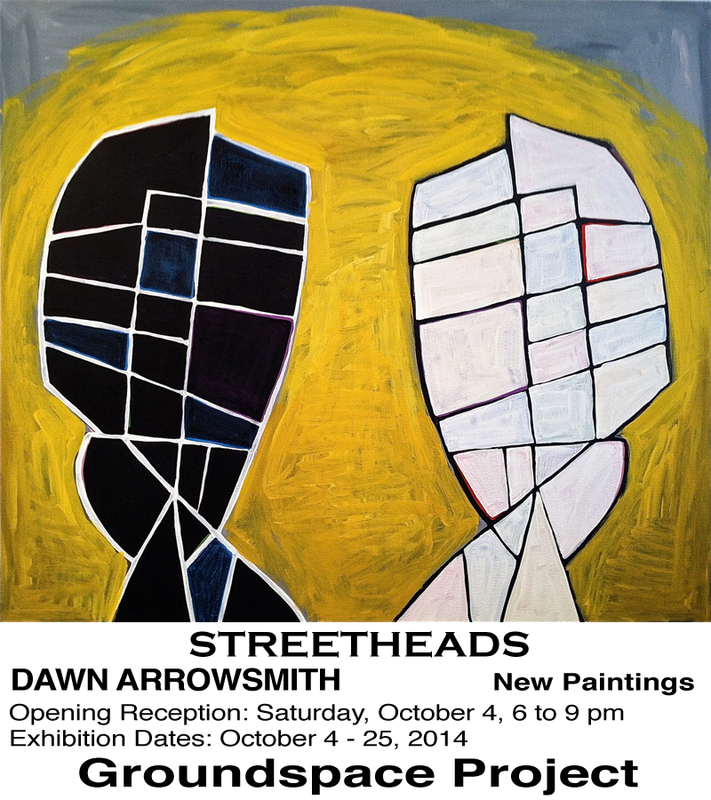 Groundspace Project is pleased to present Dawn Arrowmith’s new paintings, “STREETHEADS”. Please join us for the opening reception Saturday, October 4, 6:0 to 9:00 pm. Dawn Arrowsmith is an American artist based in Los Angeles, California. She has exhibited her paintings, works on paper, sculptures, installations, and performance work in the United States, Europe and Asia. Her work is included in many corporate and private collections including Eli Broad/Sun America, The Capital Group Foundation, the Ducal Palace, Gubbio, Italy, and the Princess Madawi M. Aboulaziz of Saudia Arabia. Have you ever traveled down a street where you used to live and realized how deeply connected you are to that place in time and those moments of your life experience there? In this new body of work Arrowsmith incorporates the cartography of specific areas in and near downtown Los Angeles where the artist has lived for over 30 years. These streets and places trigger powerful memories that can provide the basis for an almost infinite set of personal portraits that are a kind of psychological mapping. Using the linear street grids to inform the compositions, Arrowsmith’s Diebenkorn-Heilmann-like application of rich colors works to transform the city into interactive and humanized portraits of place. One could say we are the sum of the places we’ve lived and traveled, and all those that we’ve met, experienced or been influenced by along the way. Downtown, uptown, crosstown in everything we do, in everywhere we are, exists the traces of our lives. Experiences in time and place recorded on streets are the subject of this work.